Fresh figs are lusciously sweet with a texture that combines the chewiness of their flesh, the smoothness of their skin, and the crunchiness of their seeds. They are available in varied colors and textures. Ripe figs are soft and tasty, and fit to be eaten as it is or to be added to fruit salads. Raw figs are tart but make a tasty addition to spicy curries. The glycemic index of figs is 51 which falls under low GI category, while the glycemic load of ¼th cup (50 grams) of chopped fresh figs is around 2. Is Fresh Figs safe for Diabetics? The glycemic load of ¼th cup of chopped fresh figs is 2 which is due to its low carbohydrate content (3.8g). Carbohydrates plays an important role in keeping the blood sugar levels stable. Fresh figs are sase for Diabetics. Thus it is necessary to keep a check on type and the quantity of carbohydrate intake per meal. This way the blood glucose levels will be consistent. It is also a good source of calcium and maintains your blood pressure. It is rich in vitamin A which improves your vision. 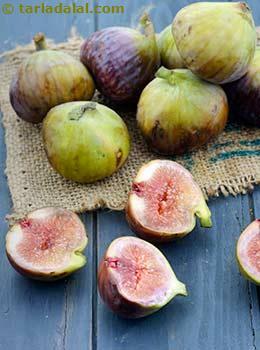 Enjoy eating figs in moderation so that your blood glucose levels do not fluctuate. Is Fresh Figs suitable for Weight Loss? Including fruits and vegetables in your diet on a daily basis majorly contributes in your weight loss regime. Keeping your carbohydrates and calories low, the fats stored in the adipose tissues breakdown as an alternate source of energy to glucose. Thus Freah Figs aids in weight loss. The glycemic load of ¼th cup of chopped fresh figs is 2 because it provides only 3.8 grams of carbohydrates. It is an ideal option to have as a snack in between your meals over unhealthy binge eating. It also contains 1.1 gram of fiber which contributes to satiety.